Lucidity, a photo by Nitesh Bhatia (navapalavalabhatia) on Flickr. ...And when I asked for intro: "Mera naam Somes hai aur mein JCB chalata hu..."
The Temple and The Kid, a photo by Nitesh Bhatia (navapalavalabhatia) on Flickr. Ever given a thought on the sound produced by temple bells during aarti? I was out at this artificial lake construction site at and this kid's dad came for a pic. 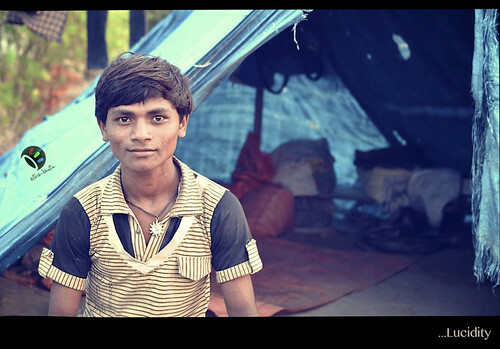 I asked him to stand in from of temple, located nearby since it was giving nice color to background. The first shot I was able to take nicely but it was hard to gather kids attention. And suddenly 7 o' clock aarti started in temple and these are the shots I got. Look at the kid for a moment !! 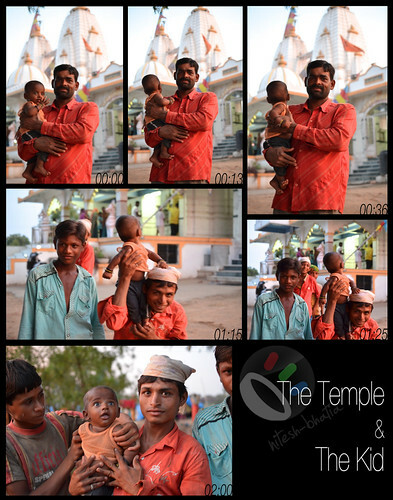 I was amazed to see the expressions of this kid in the last pic - where they are now facing towards the temple - i.e. the temple is at my back. I made a collage of the pics along with time, just to show the magnitude of attraction from temple bells.